If you've read this blog for any length of time, you know about the boxes of awesome that Meredith periodically sends me. I'll get an email or a whisper where the sum total of the comment is, "Bwahahahahaha." I know, with that simple word, that she's been shopping again and there is a box winging its way to me. 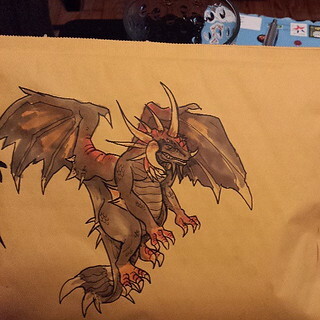 So when I got a Facebook message from a member of my World of Warcraft guild with this image and a note, "Mystery envelope. What's in it and where is it going? ", I knew Lisa was up to something. The envelope arrived on Tuesday. To say it is a masterpiece is an understatement. Now, if you are unfamiliar with World of Warcraft, these images won't mean anything to you. C'Thun, a murloc, a Anubishan warrior, a demon, an elemental, a firehawk, an imp, a pumpkin pet and Onyxia. What you need to be impressed with, even if you don't know what all these characters are is the quality of the art work. Lisa's husband, Chris, is an accomplished artist. I can't really afford his pieces so I have admired them from afar. To see all of these creatures, denizens I know so well, on a bag for me was astonishing, to say the least. I did the best I could to separate the bag into one piece so I have the whole thing. I have to frame this. I just don't know how. It's a truly amazing piece of work. Lisa said the gal at the post office was quite impressed too and put the postage stickers in the upper right so they didn't cover the art. So, what, you are wondering, would be contained in such an envelope? Look! 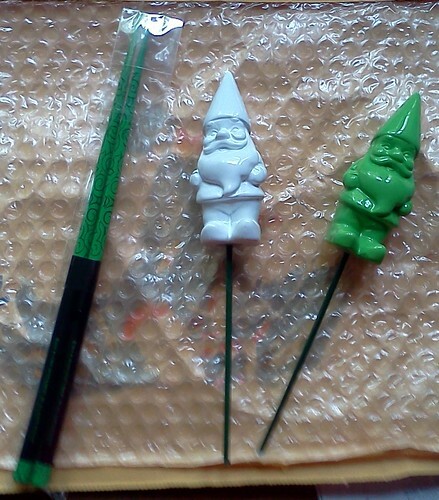 I got a pair of chopsticks and a couple of gnomes. I have to have Asian food this weekend to use the chopsticks. And the gnomes? Well, I knew exactly where they had to go. Talk about the perfect adornment. 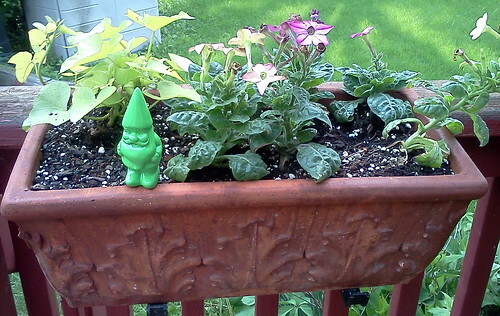 I'm going to enjoy having gnomes watch over the deck this summer. Thank you, Lisa and Chris. 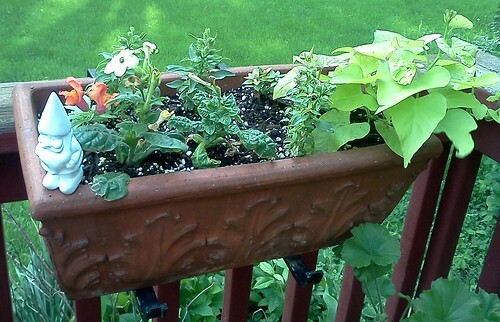 What a fun and totally unexpected gift.